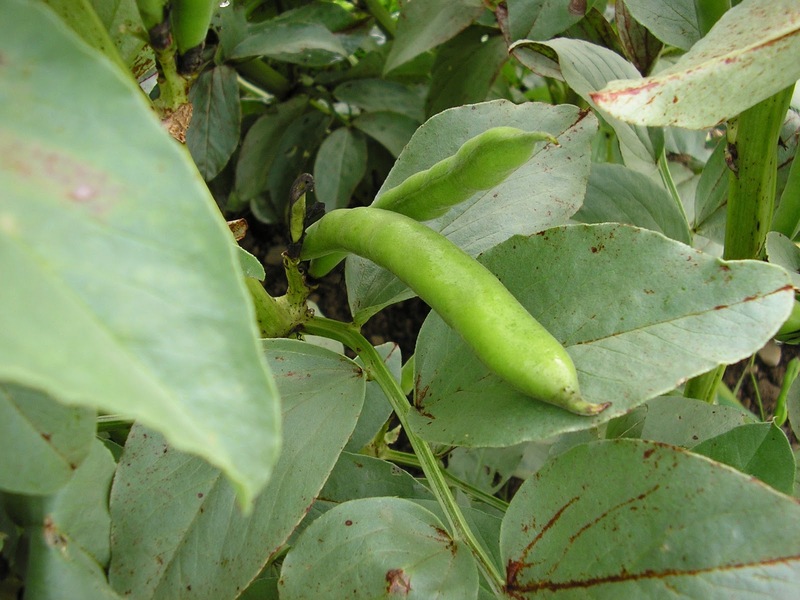 Broad Beans (Vicia Faba) also known as Fava Beans, are not usually available in supermarkets so home-grown pods are often the first many of us will ever try. Larger beans must be shelled before they’re cooked, and can then be eaten hot or cold. Big mature beans should be shelled and after they’ve boiled, the tough outer skin removed and the small beanlet inside can be mashed with butter (you’d need the patience of a saint to do that very often!). We usually dish them up with dinner and remove the beanlets ourselves. We’ve always grow Broad Beans in our garden as three of us love to eat them cooked (I usually steam them) and the two girls love them raw. They’re a very easy first veg to grow and ideal for beginners. They’re also very hardy and most varieties can be sown outside from October/November or February to April. They germinate at much lower temperatures than most other vegetables and we tend to sow them here in or around February, depending upon conditions, making them our first legume crop (pea/bean) of the year. We usually plant the seeds straight into the soil about 2.5 cm (1″) deep but they can be started off in modules in December, ready to plant out in February. 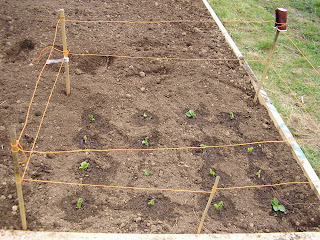 It’s also a good idea to place stakes around the perimeter of the crop which will help to prevent the stems snapping in the wind (they’ll support each other). 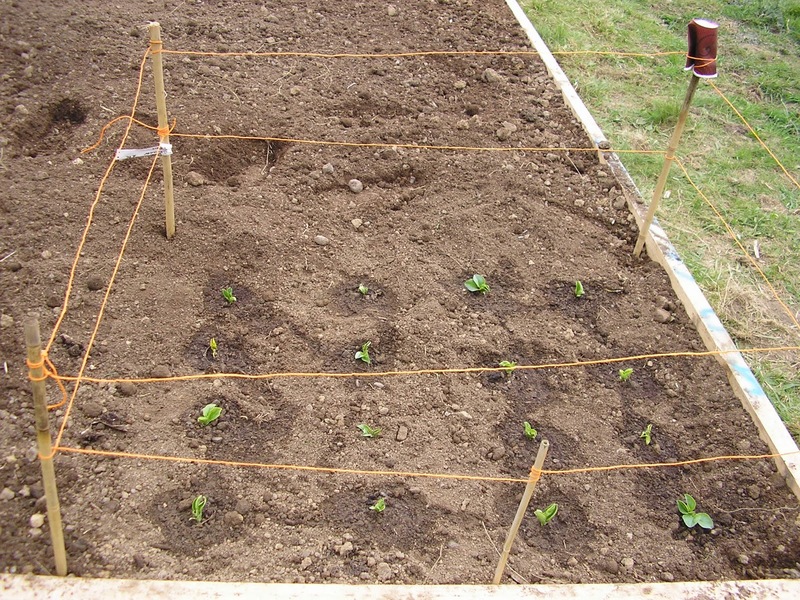 Broad beans like well-dug, previously manured soil so are an ideal crop to follow potatoes. 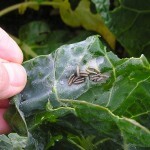 Once they’ve all been harvested, if they’re disease free chop the stems off at soil level and compost, leaving the nitrogen fixing roots in the soil to help the Brassica type crops (cabbages etc) that might follow them. Things to watch out for ……. 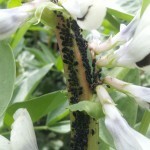 if you plant broad beans in the Spring, one day you may wander into your garden and find that the tops of them are covered in blackfly, who adore their sweet flavour. 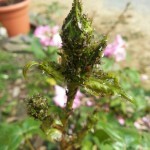 Sometimes just spraying them hard with the hose is enough to remove them, or pinching off the tops of the plants as soon as you notice the little black aphids. A garlic spray works wonders on them too but will have to be repeated regularly. 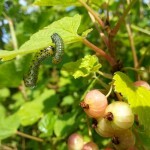 We try to encourage beneficial insects into our garden that will prey on the predatory aphids, but hoverfly and ladybird larvae never seem to be around at this time of year when we need them! Chocolate spot …… this is a disease that’s particular to broad beans and one we’ve suffered on every crop grown here. It is what it says … chocolate coloured spots that appear on the leaves, and then spread to the stems, flowers and pods, potentially leading to the plant’s death. It’s caused by a fungus (Botrytis fabae) that thrives in damp, humid air and can overwinter on the remains of previously infected plants. 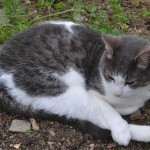 For this reason it’s a good idea to get rid of old, infected plants rather than composting them. The good news is that it usually affects the pods last of all so whilst they remain unaffected (or infected), they’re still fine to eat. Spacing the plants well, about 25cm between each plant – will help with air circulation and may prevent or delay infection. So why not give Broad Beans a chance? 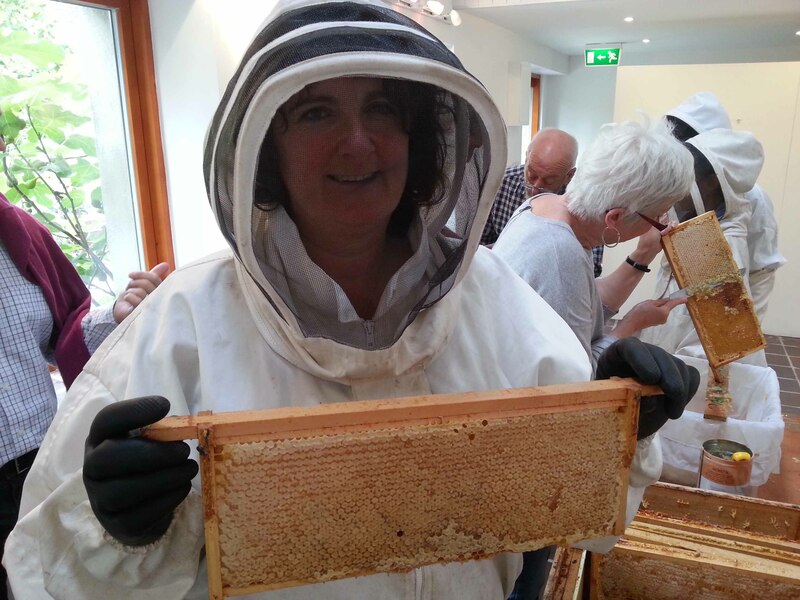 They’re a great crop for grow your own newbies as their success rate is high, which all helps in raising the confidence levels. They're great aren't they…. they've never failed us. Last year we planted them in the tunnel around November and were blessed with an early crop. Our ground is frozen solid here at the moment and if there's no change soon we'll be planting them in the tunnel again this year. Thanks for your comments.